Click Here or on the Book to Go to Amazon Affiliate Link. "Alexander Lyon presents 31 case studies in organizational communication that explore issues of courageous communication. 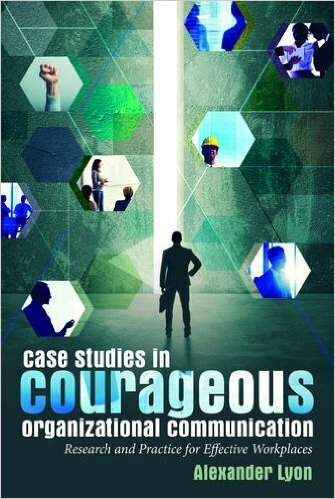 Through case studies on many well-known organizations such as Google, the Miami Dolphins, NASA, Comcast, the Boy Scouts of America, Netflix, Taco Bell, Massachusetts General Hospital, Merck Pharmaceuticals, and others, the book articulates a communication-based model of courage around four themes: Courageous communication is collaborative, upward, transparent, and engaging. ​The book presents both effective and cautionary portraits of organizations as they responded to complex issues. It situates the case studies in existing literature and provides practical guidance for enacting courageous communication in professional settings." The book (2016) is published by Peter Lang, Inc. an international academic publisher.